According to figures from the European Commission in 2015, the European Union recorded a total of 228.7 million employees, with an employment rate of 65.6 percent. Iceland had the highest rate of employment in Europe with 86.5 percent of the total population in work, followed by Switzerland and Sweden. That same year, Germany had the highest number of females in employment in Europe with 17.9 million workers, followed by the United Kingdom and France. According to Eurostat, Iceland also had the highest amount of weekly hours worked for both genders, averaging at 47.4 hours for men and 41.7 for women in 2015. When considering part-time jobs, residents of Belgium worked the highest number of weekly hours at 23.9 hours. Focusing on wages and salaries, with an average annual income of almost 38.5 thousand euros for a single person without children, Luxembourg had the highest average net wage in the European Union in 2015, followed by the United Kingdom and Denmark. Taking into account some industries of interest in Europe, several trends and dynamics can be identified. Travel and tourism directly contributed to employment by generating approximately 14.3 million jobs in Europe in 2017, with figures continuing to grow. Conversely, in the EU textile and clothing manufacturing industry, employment levels have fallen since 2009. In terms of countries, Switzerland had the highest rate of employment in the medical technology industry, while Germany had the highest number of individuals directly employed in the beer brewing industry. Some figures can be used to give an idea of the representation of female workers in Europe. With a share of 25 percent, Ireland accounted for the largest percentage of female IT specialists represented in IT businesses. Approximately 55 percent of people employed in the sport industry in the European Union were male. However, according to data for Italy, women compared to men earned on average 14.84 euros less per hour. 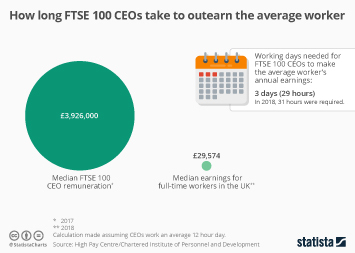 The same can be seen in the United Kingdom, where male earnings are consistently higher than those of females, although the gender pay gap has decreased.